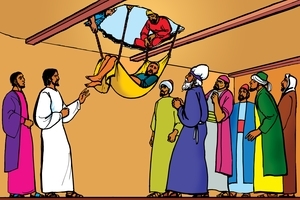 रुपरेखा: Jesus healed and forgave the paralyzed man let down through the roof. We can't do good works to be forgiven. Only Jesus can heal us by forgiving us. Jesus forgives us if we truly believe Him. Jesus will forgive you now. I want to tell you a story how Jesus healed a man and how He forgives people's sins. Once Jesus was teaching inside a house. He was teaching powerfully and also healing people of their sicknesses. Many people came to hear him. Even the religious and political leaders were present. There were so many people that the house was full and overflowing out the door with people. Then four men came carrying a paralyzed man on a stretcher. They wanted to set him in front of Jesus, but they were not able to enter the house because it was full of people. In that area the people's houses had flat roofs. So they took him up on top of the roof of the house. They broke up part of the roof and made an opening large enough for the stretcher. Then they set the paralyzed man down right in front of Jesus. When Jesus saw their faith he said to the paralyzed man, "Son, your sins are forgiven." The religious leaders said to themselves, "This man is making a mock of God. Who can forgive sins except God alone?" Jesus knew what they were saying in secret. He asked them, "What is easier to say, `Your sins are forgiven' or to say `Rise up and walk'?" In order to show that He had power (and authority) to forgive sins He said to the paralyzed man, "Get up, pick up your bed, and go home." And the man did that. Then everyone was amazed and they glorified God. God had given Jesus this authority to heal and to forgive people of their sins. This story I have told you is a true story. Like this sick man, we too have problems. Sometimes our bodies are sick and need to get well. But all of us have sinned against God and therefore need Jesus to forgive us. The paralyzed man did not DO any good works in order to be forgiven. He and his friends believed that Jesus could help them, and He did help them. You and I, too, cannot do any good works so that we will be forgiven. Forgiveness cannot be bought like a piece of wood or a sack of guinea corn or groundnuts (rice or lentils). Jesus forgives us when we believe in Him. He sees our need, and He also knows our inner thoughts. He knows if we are truly believing Him, and if we desire to obey Him. If we truly believe Him He will forgive us. God the Father has given this authority (power) to Jesus and to no one else. You have heard how Jesus healed and forgave this paralyzed man. Like him, each one of us has a sickness. It is called SIN. We are born with this disease, and only Jesus can heal us by forgiving us. If we are not forgiven, we will die in our sin. If we die in our sins God cannot accept us into heaven. We will go to the place of suffering. The payment for sin is death, but God's free gift is life that never ends. It is a life of great happiness. Jesus will forgive you now if you believe in Him and confess your sins to Him. GRN has recorded a version of this script in 342 languages and dialects. See full list.